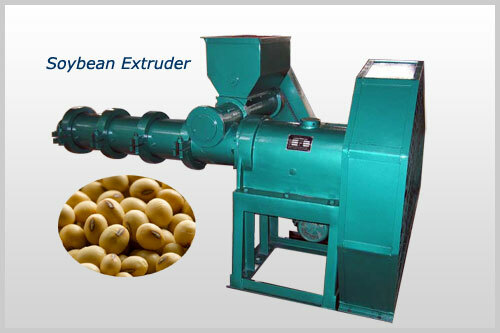 TXP seriers oil extruder machine is the main technological equipment for rice bran stabilizing treatment and bean extruding in cereal and oil industry, and also can be used to manufacture different expanded feeds in oil mills, rice mills, soybean protein factories and feed mills. This extruder had the honor to win the National New Product Certificate granted by the State Science and Technology Commission, and is a patent product with a patent No. ZL90224391.8 of our works. This oil extruder machine can transfer mechanical energy to thermal energy by extrusion, friction and shearing function of non-equidistance screw extrusion system, and form a certain pressure and temperature in the extruding chamber, so material is sprayed out from the discharging die head to be expanded and formed. All of the oil extruder machines listed above are matched Chinese Standard electricity situation:380 Volts, 50Hz, 3 phases. If clients have special electricity requirements on the machine, clients should pay the extra cost of electricity special require. If you have any question or advice , pls feel free to contact us without any hesitation. Anytime you are interested in our oil extruder machine, contact us without hesitation, we are always ready to give you the best service!